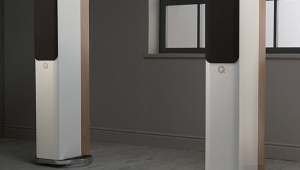 On two occasions I've caught myself wondering how to afford a pair of Wilson Audio loudspeakers. Interestingly, both happened within the past year. The first was in April 2009, at the Son et Image show in Montreal, during a demonstration of the MAXX Series 3. The experience was notable for its blend of genuinely great sound with genuine musicality: Each performance unfolded of its own natural accord, with human randomness and nuance, and without the fussy, mechanical, shallow artifice that attracts some audiophiles in the way a carnivorous plant attracts fliesand, if they're lucky, kills them (the audiophiles, that is). That demonstration was also among those rare hi-fi times when I felt a rash of envy creep up my neck: What a shame, I thought, that such performance could be bought only by hedge-fund managers, real estate developers, film producers, and (not to be snitty about it) successful manufacturers of high-end audio gearbut not me! 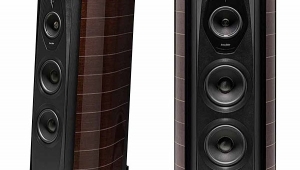 My second Wilson Träumerei happened last week, while listening to the company's Sophia Series 2, surely one of the three or four best loudspeakers I've ever enjoyed at home. As recently as a year ago, I was no more likely to say such a thing than I was to declare a newfound passion for air travel, or to invite Lou Reed to "sing" at my next birthday party. As recently as the 20th century, in fact, I was responsible for an unambiguously negative review of the Sophia's predecessor, the Wilson WITT (published in the short-lived magazine Fi), and thereafter I wasted no opportunity to make no secret of having no love for the Wilson sound. I was a one-man party of no. Then came two notable events, one of them unexpected. 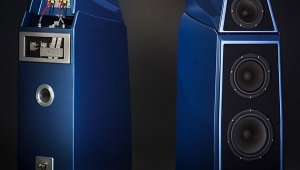 First, Wilson's nearly iconic WATT/Puppy, whose proportions and pricing have been aped by so many competitors in its 21-year run, was replaced by a new and slightly less expensive full-range loudspeaker, the Sasha ($26,900/pair). 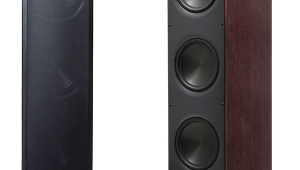 Second, because the folks at Wilson Audio (footnote 1) wanted to solicit opinions from other than the usual writersand, I daresay, because all interested parties, myself included, thought it sounded like a fun ideait was decided that I should get the first review pair of Sashas. But: My admittedly offbeat point of view comes from having spent the last 12 years with certain admittedly offbeat loudspeakers, from my horn-loaded Lowthers to my corner-mounted Audio Notes to my beloved but beamy and famously hard-to-drive Quad ESLs. Consequently, it was also decided that I should gradually ease my way toward the Wilson Sasha experience. 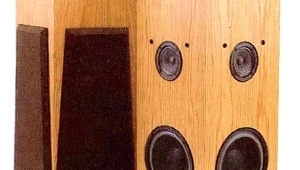 Thus did Wilson's national sales manager, Peter McGrath, arrange the loan of a pair of Sophia Series 2s ($16,000/pair, reviewed by Brian Damkroger in November 2006). And now, for the very first time, I've recaptured the mix of feelings I had nearly 40 years ago, when a guest in my parents' home tossed me a set of keys and asked me to move his Lincoln Town Car. I didn't think I'd be impressed, but after only a minute, I couldn't help wondering how it would feel to drive it to the edge of town and just keep going. 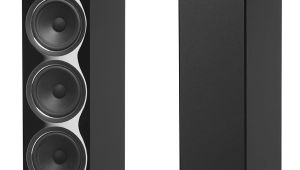 The Sophia Series 2 is a 42"-tall, three-way, dynamic loudspeaker intended for use in rooms of reasonable size. 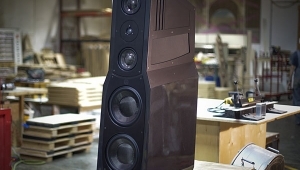 The various panels, baffles, and braces that comprise its one-piece enclosure are machined from phenolic materials called X and M, both supplied to Wilson Audio in sheet form by a company whose largest client is the US military. X and M are prized for their ability to self-damp, which they do without excessive, energy-storing mass. 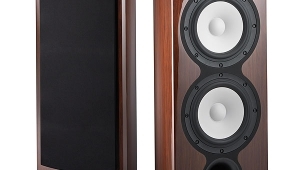 Even the frames for the speaker's removable grilles are made, exquisitely well, of X and M.
In common with other Wilson speakers, the Sophia's treble driver is made by Focal: a 1" inverse dome of titanium gilded with a carbon deposit. The 7" midrange driver, built to order by ScanSpeak, has a pulp cone and dustcap, both embellished with a pinwheel of painted slits intended to prevent unpleasant resonant modes from getting their start in life. 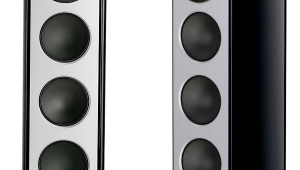 The 10" bass driver, also made in Europe and also unique to Wilson Audio, has a very smooth, lightweight cone of aluminum. The Sophia's front baffles are recessed and covered with neat blotters of dense black foam, presumably to control diffraction; the Focal tweeter is bordered with an additional sheet of wool felt, recessed deeper than the one of foam. Around back, the upper and lower chambers of the Sophia's cabinet are each reflex-loaded via an aluminum-lined port; these are, respectively, 1" and 3" in diameter. 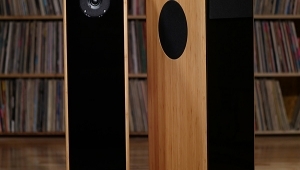 Wilson loudspeakers are famously non-biwirable, and their maker is just as famous for concealing the secrets of their crossover networks. I did, however, learn that the Sophia's crossover is completely hardwired, point to pointas McGrath points out, a PCB is like a sail in the wind, of which there's no shortage inside a loudspeakerand all of its component parts are selected for being within 0.1% of their target values. 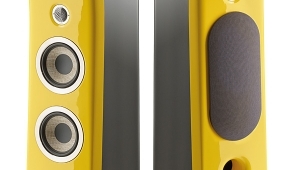 I'm also told that the connecting wires inside this and other Wilson speakers are selected and sized for their specific circuit locations: the crossover-to-woofer wire, for example, is chosen for its unique electromechanical properties, and is dressed with a certain number of twists to achieve a precise inductance within the circuit. 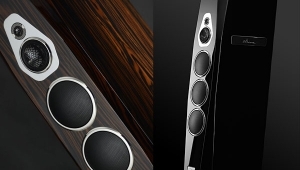 Yet none of that connotes the apparent quality of a Wilson loudspeaker, which is considerable. The Sophia's drivers are remarkably serious-looking, made with seemingly great precision and held in place with machine screws of austenitic (nonmagnetic) stainless steel. Austenitic pins hold the grilles in place, too, with a snug and altogether perfect fit that calls to mind the oil-filter housing of a BMW motor. The cylinders within that same car's brake calipers are surely honed with no greater precision than are the Sophia's aluminum reflex ports. The precisely cut sheets of foam and even wool are as flat and perfect as panes of glass. The paint is flawless and smooth, as if the whole of the thing were frozen from a drop of mercury. The Sophia's adjustable feet and their corresponding threaded inserts are made with such precision that leveling and stabilizing each cabinet was more of a pleasure than a choreno small concern with a loudspeaker that weighs 160 lbs. 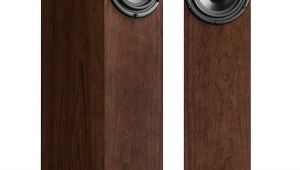 Truth told, the latter wasn't a worry: As with any set of Wilson speakers sold by an authorized dealer, my review pair was installed by a factory-trained setup technicianin this case, the estimable Peter McGrath himself. I observed and assisted (mostly observed), and you may rest assured that the process is every bit as systematic, painstaking, and successful as you might have heard: Moving the cabinet as little as half an inch really did have an impact on the sound. But for now, file that away . . .